What are the ingredients for a perfect party? 2 parts fun people, 1 party music mix, 1 part food and drinks and you’re sure to have a fantastic night. Once upon a time, my New Year's Eve parties were not very kid-friendly. Now, most of my friends have children and we all know how hard it can be to find a babysitter on January 31. 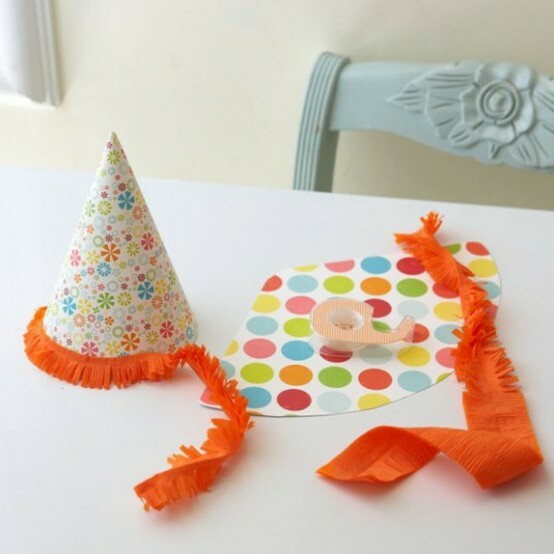 But don't worry...make the party special for your littlest guests and everyone will have a good time. Tables with crafts and coloring pages will entertain children for a while and provide unique party favors. 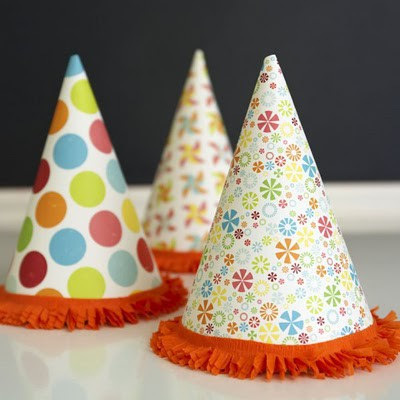 Party hats are fun, too. Now that my twins are 9, I've noticed what a big help they can be with younger children. In no way are they able to babysit or be responsible for little ones, but they're great helpers and love to help younger children with crafts or to entertain them with a story or game. 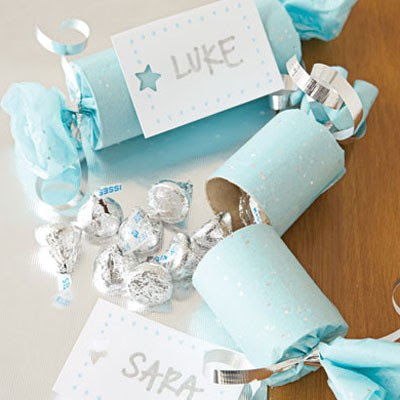 And would you believe that you can make the cutest party crackers out of paper towel rolls? Put all of the supplies on the table with easy instructions so that children need little to no adult supervision for the activity. Again, if you have some "older" children to help with the craft, it will be a worry-free task for moms! Movies can be shown on a tv in a separate room, too. 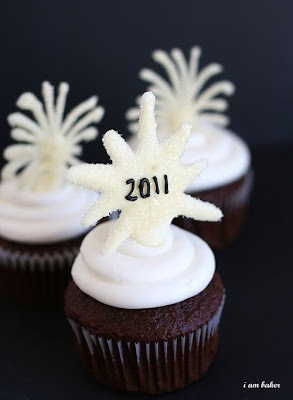 Perfect options for your New Year's Eve party guests include: Charlie and the Chocolate Factory, Happy New Year, Charlie Brown, and Rudolph's Shiny New Year. Sometimes children don't want to watch tv with the adults or need a little space of their own. Simple sandwiches, finger foods, and kid friendly treats suit even the most finicky eater. Of course, everyone loves cupcakes! Creating a signature drink with a unique name is a fun way to personalize a party and add some fun. On New Year’s Eve, a non-alcoholic drink will delight designated drivers, pregnant peeps, and children who will feel so elegant at the party. It's the tried and true "Shirley Temple" formula. If my girls are allowed to have a Shirley Temple, that means that the restaurant is elegant or the occasion is very special! It's amazing how their behavior mirrors their perception of the event and my girls turn into ladies. Use plastic champagne flutes for children who have graduated from the sippy cup. They'll love it! 1. Fill a plastic champagne flute half way with crushed ice. 2. Add sparkling white grape juice until the flute is ¾ full. 3. Finish with a splash of orange juice. 4. Garnish with frozen berries. With the right activities, the right food, and the right drinks, you'll keep little ones entertained and make it a Happy New Year for everyone! 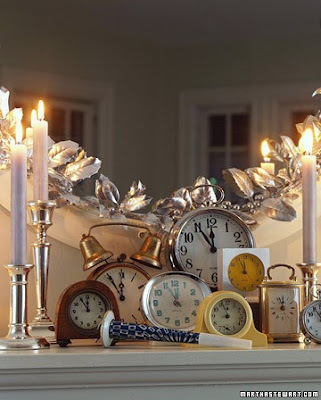 Do your New Year's Eve plans include children? How are you going to keep them entertained? Congratulations to Keonte S! You're the lucky winner of tickets to attend Midnight Noon, the New Year's Eve celebration at the Maryland Science Center. Please email me to confirm details for your tickets. Wonderful post! Mike and I will be alone for New Year's Eve but will spend the day with the boys in the country eating black-eyed peas and collard greens for good luck! One of my favorite New Year's (and this helps because I am big on celebrating) was when I was in the 5th grade and we had a slumber party at a friends house. They got us the plastic champagne glasses and sparkling grape juice to toast with at midnight. We felt like the grown-ups.